1860 John Bell Presidential Campaign Medallion, Unc. 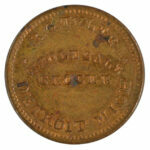 1863 Civil War Token, Grand Rapids, Michigan, J.W. Pierce, Unc.